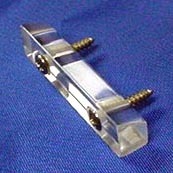 Vintage-style clear reproduction finger (thumb) rest designed to fit Rickenbacker® basses. Available in 1-1/8″, 1-1/4″, 1-3/8″ and custom hole spacings. These clear finger (thumb) rests are designed to fit Rickenbacker® basses from the 50’s and 60’s. Based on an actual “tug bar” finger rest from a 1960’s Rickenbacker Bass, they feature the proper angle on one side. Perfect for vintage replacement for your 4000/4001 or for customizing to your 4003! The standard sizes we make have a center-to-center hole spacing of 1-1/8″, 1-1/4″ and 1-3/8″. As is the case with most Rick products, variations do exist. Double check the measurement and let us know if you need a custom size (done at the same price). Comes with two 1″ screws. 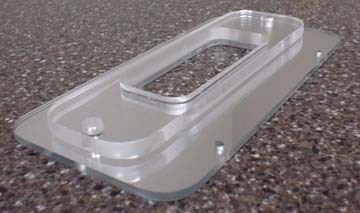 These parts are made by Pickguardian and are not to be represented as products of Rickenbacker®.